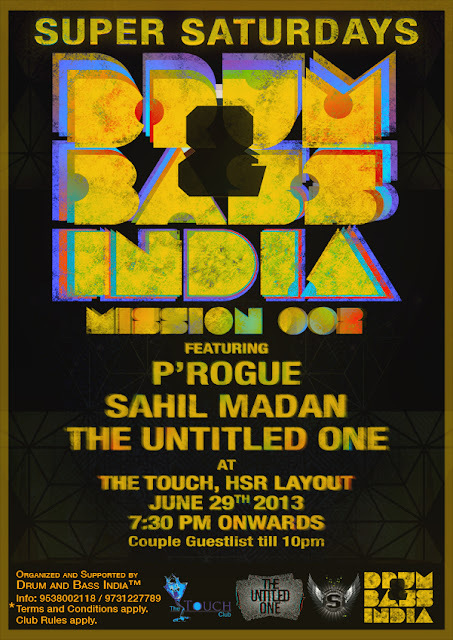 Drum and Bass India™: Drum and Bass India™ Mission 002 - Superr Saturdays ft. Dj P'ROGUE, SAHIL MADAAN and THE UNTITLED ONE at The Touch! Drum and Bass India™ Mission 002 - Superr Saturdays ft. Dj P'ROGUE, SAHIL MADAAN and THE UNTITLED ONE at The Touch! After the success of our first event 2 weeks back, here is our 2nd BASS HEAVY event again, to make you all LovethatBass! As usual, We are giving Bangalore something new! BASS HEAVY Music + Groovy Electro by Dj P'ROGUE, SAHIL MADAN and THE UNTITLED ONE. Commercials will be blasted for the commercial lovers (for a bit tough :p) by the Resident DJ, Daljeet. Single Girls : Walk-in Free. Couples Guest list till 10:30pm, post Rs.500/- Full Cover. Stags : Rs. 500/- Full Cover.